“A few words which the capricious Henry spoke to certain courtiers who hated Thomas, sufficed for the latter to decide to do away with the prelate who contravened all their unchristian doings. They violated a monastic cloister and chapel to enter there while he was assisting at Vespers; the Saint himself prevented the monks from resisting the assassins at the door. Refusing to flee the church as the assassins summoned him to do, he was slain before the altar, by cruel and murderous repeated blows on the head. He died, saying: I die willingly, for the name of Jesus and for the defense of the Church. 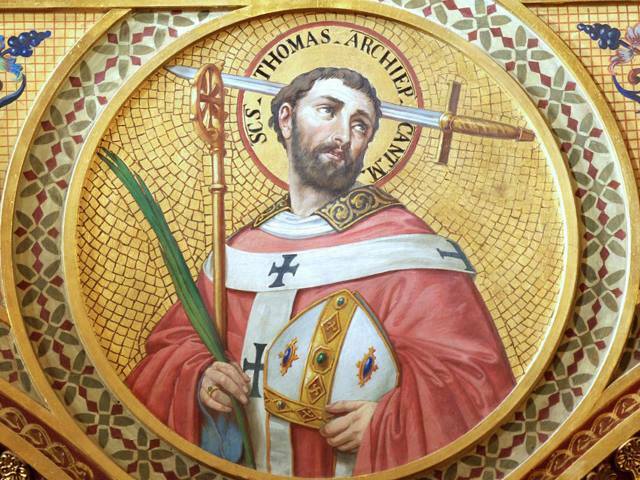 Archbishop Thomas Becket was canonized by Pope Alexander III on Ash Wednesday, 1173, barely three years after his death on this date in 1170. Let us pray for Becket’s guidance and intercession before the Throne of Grace for 2016.